A new exhibit at RIT/NTIDâ€™s Dyer Arts Center, which runs through April 21, highlights non-objective art by deaf artists. 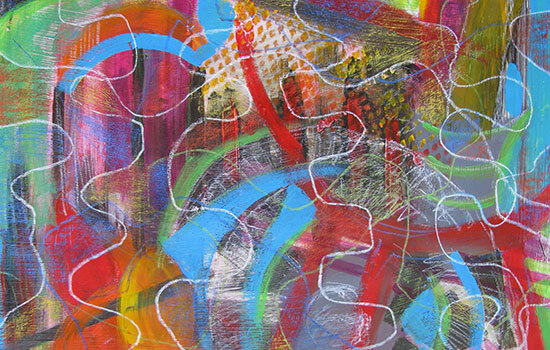 Pictured is <em>Deaf Space</em>, an acrylic and pastel piece created by artist Tracey Salaway. A new exhibit at the Dyer Arts Center at Rochester Institute of Technology’s National Technical Institute for the Deaf features the artwork of deaf artists during “Beyond Form: Non-Objective Art.” An opening reception at the gallery will be held from 5 to 7 p.m. March 30, and a talk by guest curator Brenda Schertz is scheduled for 4 to 6 p.m. April 20. The exhibit runs through April 21. All events are free and open to the public. “Beyond Form: Non-Objective Art” explores the work of deaf artists in a wide variety of media and, according to Schertz, provides viewers scope to use their imaginations in interpreting what is—or is not— perceived in images beyond their forms. She also believes that the exhibit is the first effort in bringing abstract art together by deaf and hard-of-hearing artists. More than 15 professional artists who are deaf or hard-of-hearing are participating in the exhibit; five of those artists are RIT/NTID alumni. The gallery is located in Lyndon Baines Johnson Hall, RIT/NTID, 52 Lomb Memorial Drive, Rochester. For more information, go to www.rit.edu/ntid/dyerarts/.